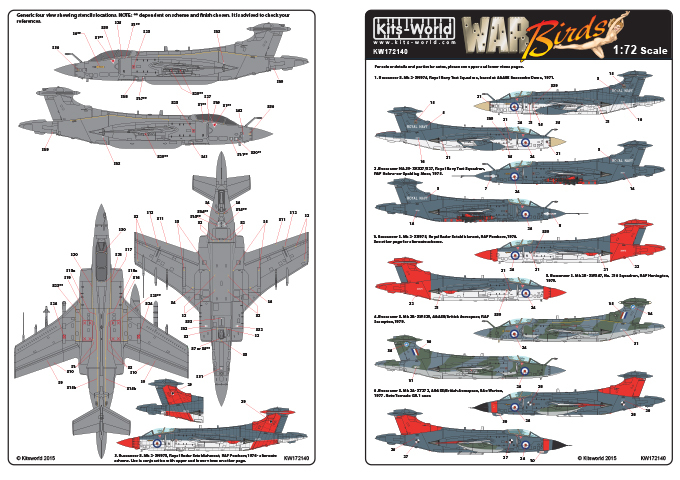 KW172140 Blackburn Buccaneer British Research and Development Establishments. Buccaneer S. Mk 2- XN974, Royal Navy Test Squadron, based at A&AEE Boscombe Down, 1971. Buccaneer NA.39- XK527/527, Royal Navy Test Squadron, RAF Holme-on-Spalding Moor, 1975. Buccaneer S. Mk 2- XN975, Royal Radar Establishment, RAF Pershore, 1976. (Alternative Scheme). Buccaneer S. Mk 2- XN975, Royal Radar Establishment, RAF Pershore, 1976. Buccaneer S. Mk 2B- XW529, A&AEE/British Aerospace, RAF Scampton, 1979. Buccaneer S. Mk 2B- XW547, No. 216 Squadron, RAF Honington, 1979. Buccaneer S. Mk 2A- XT272, A&AEE/British Aerospace, BAe Warton, 1977. Gulf War Blackburn Buccaneers 1991. 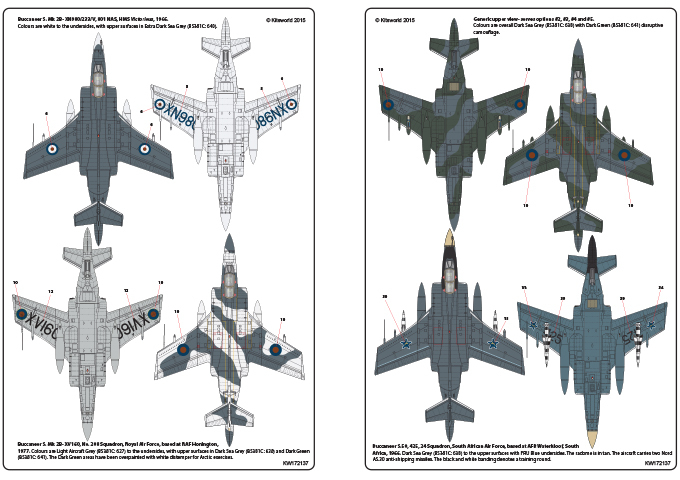 Includes 6 aircraft from Operation Granby. 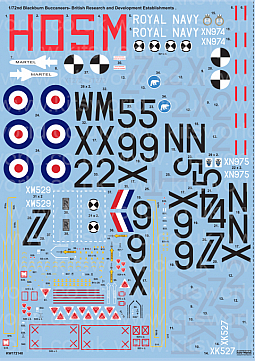 Sky Pirates flags, Scotch Whiskey names, nose art serials and codes and stencilling where appropriate. All desert pink camouflage. XV863 'S' 'Sea Witch' 'Debbie' 'Tamnavoulin'. XX885 'L' - 'Hello Sailor' 'Caroline' 'Famous Grouse'. XX901 'N' - 'The Flying Mermaid' 'Catherine' 'Glen Elgin'. XX895 'G' - 'Lynn' 'JAWS' 'Glenfiddich'. XX530 'E' 'Glenmorangie' Sky Pirates. XX352 'U' 'Tamdhu' Sky Pirates. 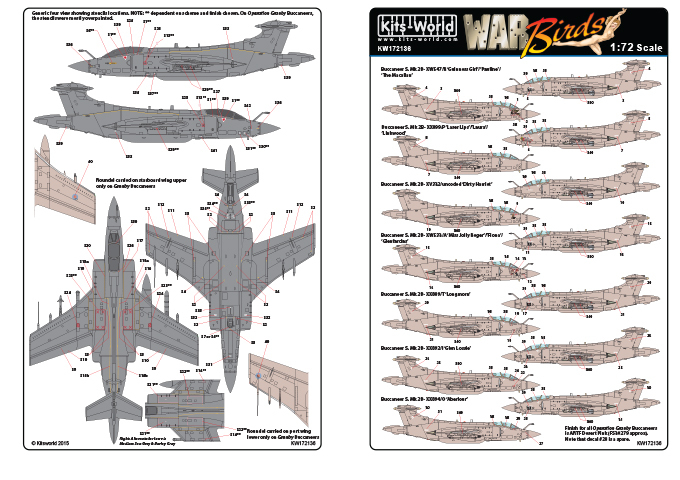 The sheet includes comprehensive Buccaneer Stencil and Data information, although used on the 'Operation Granby' Buccaneers as it was painted over with desert pink, most other schemes carried this information and we are sure the modeller will find it is a very useful addition to the sheet! Gulf War Blackburn Buccaneers 1991. 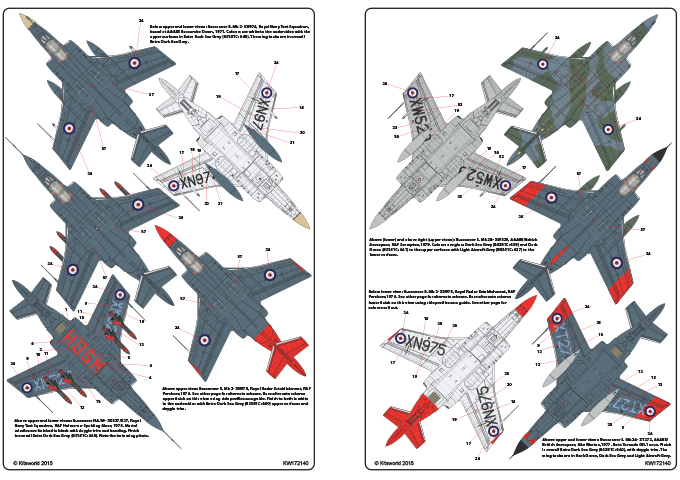 Includes 7 aircraft from Operation Granby. 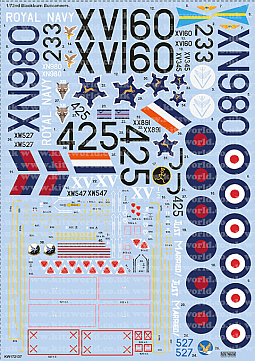 Sky Pirates flags, Scotch Whiskey names, nose art serials and codes and stencilling where appropriate. All desert pink camouflage. 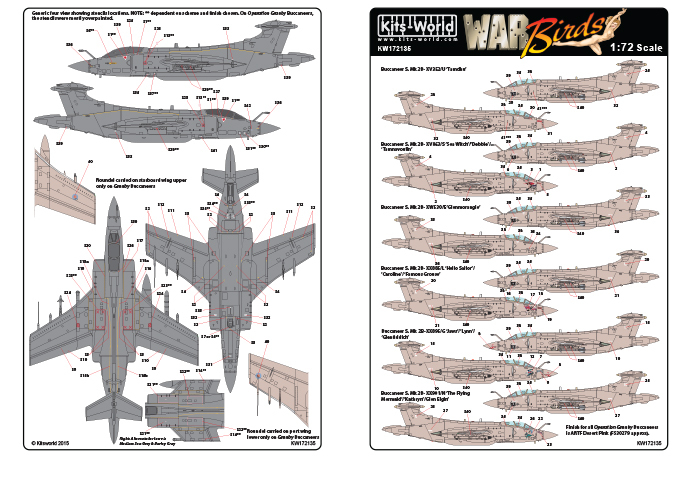 The sheet includes comprehensive Buccaneer Stencil and Data information, although used on the 'Operation Granby' Buccaneers as it was painted over with desert pink, most other schemes carried this information and we are sure the modeller will find it is a very useful addition to the sheet. Blackburn Buccaneers RAF and other operators. XN890/233/V, 801 NAS, HMS Victorious. XX891/J, 15 Sqdn, RAF Laarbruch. XW527/527, 12 Sqdn, RAF Honington. XW547, 216 Sqdn, RAF Honington. 425, 24 Sqdn, SAAF AFB, Waterkloof. 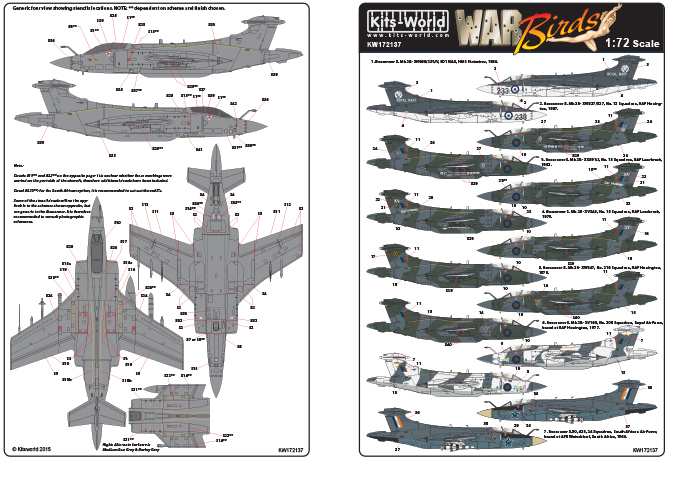 The sheet includes comprehensive Buccaneer Stencil and Data information. Many schemes carried this information and we are sure the modeller will find it is a very useful addition to the sheet.